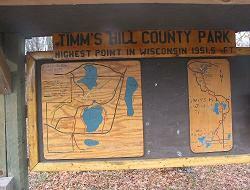 Timm's Mountain is the highest spot in Wisconsin. It is also the only highest point of a state that is not on state park territory. Timm's Hill is maintained by the county as a county park. The hill is buried deep in the northern forests of Wisconsin and surrounded by some great hiking trails. The view from the trails, as well as from the tower atop the hill, is particularly enjoyable in the fall when the leaves are changing. Climb the trail to the lookout tower. Climb the tower and enjoy the view. Climb back down and find the geological marker nearby that marks the highest point on the hill. Read carefully the height of the mountain according to the marker (it is different than on the park sign and the stamp (unfortunately)). Record the last two digits of the height indicated on the marker and divide the two-digit number by two. This is the bearing you'll need shortly. Look north and spot the yellow sheath covering a support wire for a utility pole. Walk to the support wire to where it is anchored in the ground. Take your calculated bearing. Twenty-six paces on that bearing, you will find a five foot tall hollowed stump. The letterbox is inside at the bottom held in place with a rock, sticks, and leaves. Please replace the rock, sticks, and leaves so the box is hidden when you are done. Thanks!